Email groups are an important part of business life, yet Apple's iOS offers no support for them. So what happens if you want to send a message to, say, everyone in the marketing department, or a select batch of customers? If you're using an iPhone or iPad, you have little choice but to manually select their email addresses, one after another. Until Apple corrects this glaring oversight (and perhaps even after), look no further than MailShot. This ingenious app lets you build email distribution groups, then adds those groups to your address book, where they’re accessible from all other apps. It’s even Siri-friendly. The app is a breeze to use. First, you create a group (Sales Team, for example), then choose the contacts you want to add to that group. You can pull names from your contact list (either one at a time or using a checklist) or enter addresses manually via the Import option. When you’re done, MailShot adds that group to your Contacts app. When the time comes to compose an email, you simply start typing the name of that group or choose it from the contacts list, same as you would an individual address. It’s precisely because MailShot leverages the Contacts app that it works with Siri. So if you have a group called, say, Creative Team, you can tell Siri to "send an email to Creative Team," and she’ll set one up that’s addressed to that group. Sweet. 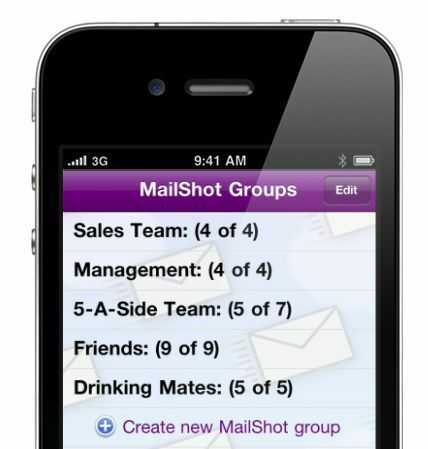 The free version of MailShot lets you create up to three groups, each with up to five contacts. Spring for the Pro version, which costs all of $3.99, and the group limit rises to 100, each with 100 or more contacts. (The developer rightly notes that some ISPs limit the maximum number of recipients for any given e-mail). I think that's four bucks incredibly well spent. The newly released 2.0 version adds support for Exchange address books, increased control over which address book is used, Retina support for the new iPad, and other helpful tweaks. It’s pretty ridiculous that even in version 5, iOS lacks support for something as simple -- and valuable -- as email distribution groups. Thankfully, there’s an app for that, and it's awesome. Like this? Be sure to check out Business Center's other App Spotlights.